Our two graduating seniors from 2018, Tori Cordista and Sophi Sampson have successfully finished their first semester in college. Tori Cordista is attending Mercer College and Sophi Sampson is attending Georgia College and State University. The senior class of 2017 had 8 graduating seniors. Alejandra Daniel, Emily White, Sydney Ellen Rawlings & Christina Maggistas have all gone on to study dance at Kennesaw State University. Aubrey Brinkley & Katie Wise are at the University of GA. Faith Luke is atteneding Mercer College and Madi Bruhn is attending UGA. The senior class of 2016 had a graduating class of 2. Stephanie Scuelly is getting her nursing degree and Lauren Kelly is getting her dance degree from UNC Greensboro. Thomasville, Ga. - Maria Dunbar, a 2015 graduate of Scholars Academy, as Tiana with David Brandon, guest artist from The Tallahassee Ballet, as Prince Naveen, perform tonight at the Cairo High School Auditorium. Thomasville, Ga. - South Georgia Ballet and South Georgia Ballet Conservatory proudly present “The Princess and the Frog,” an original dance production on May 29 and 30 at the Cairo High School Auditorium. The ballet, tap and jazz show is based on the Disney version of the classic children’s tale, The Frog Prince, written by the Brothers Grimm. As in the original story, the heroine, Tiana, is fearless and kind and she continues charming the audience in this dance rendition created by Melissa June and Alison Bundrick of South Georgia Ballet. The ballet opens in 1913 New Orleans at the home of Big Daddy La Bouff, a rich sugar Baron. His precocious young daughter, Charlotte, and her best friend, Tiana, along with some of their friends are intently listening to Tiana’s mom, Eudora, read the story of The Frog Prince. Charlotte finds the story romantic, while Tiana proclaims she would never kiss a frog. Charlotte imagines herself as the Princess who might kiss the Frog and break the spell while Tiana is forced to play the Prince. Little do Charlotte and Tiana know how fate will intervene in their lives later in the story. As time passes, Tiana and Charlotte both grow into beautiful young ladies with big dreams. Tiana dreams of owning her own restaurant and spends almost all of her time waiting tables at the local café. Charlotte dreams of true love and meeting her Prince Charming. This particular evening, the café is buzzing with excitement as Charlotte’s dad has just been named King of the Mardi Gras for the fifth year in a row. Musicians, high society socialites, and Charlotte’s friends have all gathered at the café in hopes of catching a glimpse of the visiting Prince Naveen of Maldonia. Naveen arrives in New Orleans determined to better his financial situation. His funds have been cut off by his parents so Naveen is forced to marry a rich southern belle. It soon becomes obvious that Charlotte is the perfect candidate. "Big Daddy" La Bouff and Charlotte host a masquerade ball in Naveen's honor and Charlotte is certain she will snag herself a Prince. Meanwhile, Naveen and his valet Lawrence run into Dr. Facilier, a voodoo witch doctor. Inviting them into his emporium, Facilier convinces the pair that he can make their dreams come true. However, neither man gets what they are expecting; Naveen becomes a frog, while Lawrence is given a voodoo charm that disguises him as “Naveen.” Facilier intends for Lawrence to marry Charlotte, after which he will kill La Bouff and claim his fortune. The men make a deal with Facilier unleashing the Shadows and Spirits of the underworld to do his bidding. At the masquerade ball Charlotte and Tiana both dance with Naveen in hopes of catching his favor. Tiana believes that Prince Naveen could help her realize her lifelong dream of owning her own restaurant and Charlotte is desperate for her true love and her Prince Charming. Little do they know that he is really an imposter. Not knowing that he is really Lawrence, Charlotte accepts his proposal. The wedding is set for the day of the Mardi Gras parade atop Big Daddy’s float as the King of the Parade. Tiana is devastated and runs to hide her disappointment. She makes a wish upon the evening star, Evangeline, and magically the star appears to seemingly grant her wish. She is startled to then see a frog, the real Naveen, and believing that only way she can make her wish come true she kisses the frog, but instead of Naveen turning back into a human, Tiana is turned into a frog herself. Horrified by her green, slimy appearance, Tiana escapes to the bayou to hide followed by Naveen. Meanwhile, Dr. Facilier makes a deal with the voodoo spirits, offering them the souls of the people of New Orleans in exchange for soul seekers to aid in finding the frog Naveen. At the bayou, Tiana and Naveen meet Louis, a trumpet-playing alligator who longs to be human, and Ray, a Cajun firefly. Louis and Ray offer to lead Tiana and Naveen to the good voodoo priestess, Mama Odie, who they believe can undo the curse. Along the way, they encounter a whole host of delightful characters from the bayou that keep them entertained during their travels. Ray introduces all of them to his relatives and reveals to Tiana that he is in love with one very special firefly, Evangeline. Tiana, Naveen and Louis don’t have the heart to tell Ray that his Evangeline is really a star. As Ray professes his love for Evangeline, Tiana and Naveen begin to develop feelings for each other. As their journey continues, they encounter a trio of hunters planning to catch and eat Tiana and Naveen. They manage to outwit the Cajun bumpkins and Ray leads them on through the bayou to Mama Odie’s treehouse. Just before they arrive, the four are threatened by Dr. Facilier's shadows and are almost captured until Mama Odie comes to their aid and scares away the Soul Seekers. Once they arrive at Mama Odie’s, the eccentric voodoo priestess explains that Naveen must kiss Charlotte before midnight of the Mardi Gras parade in order to break the spell and return them to their human form. They quickly return to New Orleans to try and find Charlotte before the clock strikes twelve. Searching through the festive Mardi Gras parade, the characters happen across Dr. Facilier's parade float with Charlotte and “Naveen” atop the float preparing to marry. Desperate to turn human, Naveen hops onto the float to kiss Charlotte, but is captured by the “Naveen” imposter, Lawrence. Ray tries to save him, but is overtaken by Dr. Facilier who fatally injures him. The frog Naveen succeeds in capturing the voodoo amulet around the phony “Naveen’s” neck. Dr. Facilier quickly captures Tiana and holds her hostage in exchange for his amulet. Realizing that he truly loves Tiana, the frog Naveen risks everything by jumping off the float and breaking the amulet in attempt to break the spell. The angered voodoo spirits claim Dr. Facilier himself as payment for his debts and drag him into the voodoo spirit world. As the parade ends and the crowds depart, Tiana, Naveen and Louis realize that their friend has been mortally wounded. The friends gather to comfort Ray as they witness him slipping away to meet his love Evangeline in the sky. After Ray's funeral, Tiana and Naveen realize their love for one another and the two decide they are content to live together as frogs. They return to the swamp and are wed by Mama Odie. As the two take their vows Tiana becomes Princess of Maldonia and their kiss breaks the spell, restoring them both to human form. The entire bayou celebrates the marriage of Tiana and Naveen. Maria Dunbar stars as Tiana, the determined, kind heroine. Dunbar, a senior at The Scholar’s Academy has danced with South Georgia Ballet for eight years. After graduation, Dunbar will attend Florida State University where she has already been accepted into its prestigious dance program. Other seniors starring in the show are Abby Novak and Sydney Clanton who also attend The Scholar’s Academy. Novak will play the charming role of Louis, the trumpet-playing alligator. Clanton will dance the role of Charlotte, Tiana’s best friend. In addition to the original storyline, the production will also feature cutting edge technology with regards to the stage sets and special effects. Instead of painted backdrops, the dance will be performed against projected images as the backdrops. There are more moving pieces and parts than ever before along with a multi-media background of projections, lights and sets. The technical element plays a key role in the performance. The performances are held at the Cairo High School Auditorium on Friday, May 29 at 7:00 p.m. and Saturday, May 30 at 7:00 p.m. An abbreviated performance featuring SGBC’s youngest dancers will also be held on Saturday May 30 at 2:00 p.m. Reserved seating is available. To purchase tickets please call 229-378-ARTS (2787) or visit southgeorgiaballet.org. Tickets range in price from $8-$15. Thomasville, Ga. - Dancers from South Georgia Ballet have been chosen to attend professional summer intensive programs after competing for placement with dancers worldwide. Summer intensive dance programs allows the serious dancer to rigorously study the art of dance through intense daily dance schedules. Gabrielle Wimberly, a sophomore at Brookwood School, and Emily White, a sophomore at Cairo High School, were both chosen to study at The Rock School for Dance Education in Philadelphia. The Rock is a world-renowned, pre-professional ballet school with alumni in every major dance company in the United States, in Europe and on Broadway. Its Summer Ballet Intensive will immerse Wimberly and White in full time classes in Adagio, Variations, Pointe, Repertoire, Jazz and injury prevention. White was also selected to attend the Bolshoi Ballet, International Ballet and the Kennedy Center summer programs. Alejandra Daniel, a sophomore at Brookwood School, has been accepted into the Next Generation Ballet study at the Patel Conservatory, an elite summer training program in Tampa. The renowned Patel Conservatory summer intensive will feature 30-35 hours a week of instruction in ballet, pointe, partnering, contemporary and conditioning. In addition, Daniel will learn a classical piece which she will perform at the final showcase at the Stratz Center in Tampa. SGB dancers Margaret Davis, Katie Wise, Sophie Sampson and Lauren Kelly have been selected to attend FSU’s Sumer Intensive Dance Workshop which is a two week program focusing on ballet and modern dance. They will study dance for twelve hours a day during a rigorous schedule that begins at 8:30 in the mornings and lasts until 8:30 in the evenings. FSU’s School of Dance is one of the most prestigious dance programs in the nation. Davis is a sophomore at Brookwood School; Kelly, a junior, Wise, a sophomore, and Sampson, a freshman, all attend The Scholars Academy. Ta’sina Copeland, an 8th grade homeschooler, auditioned and was accepted into the Bolshoi dance program held on the campus of Westover Academy in Connecticut. Maria Dunbar, a senior at The Scholars Academy, has been accepted into the prestigious FSU Dance program where she’ll be attending school in the fall. Additionally, Sydney Ellen Rawlings and Malley Celaya, sophomores at The Scholars Academy, were both selected as finalists for the Governor’s Honors Program in dance. The Governor's Office of Student Achievement received approximately 2,800 applicants for the 2015 application cycle and it’s an honor to be named a finalist for these programs. SGB will also host its own two week Summer Intensive program at the Thomasville Center for the Arts which has drawn dancers from all around the Southeastern United States area. 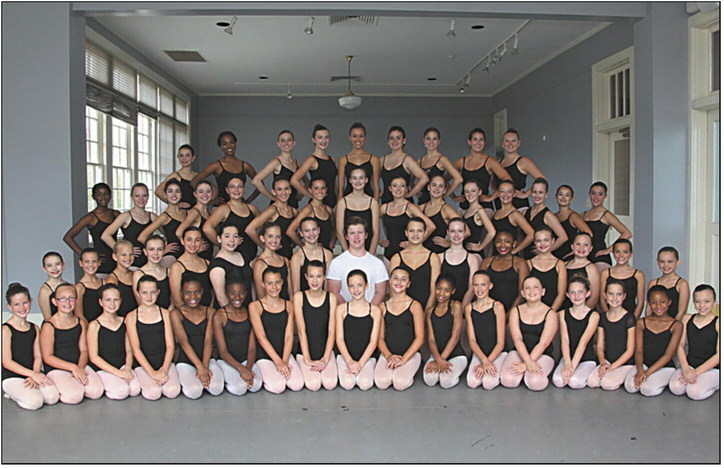 SGB’s Summer Intensive workshop will be held at the Thomasville Center for the Arts June 8-19. For more information, please call 229-228-9420 or www.SouthGeorgiaBallet.org. Pictured: (left to right) Alejandra Daniel, Emily White, Katie Wise, Elizabeth Barrow, Lauren Kelly, Sydney Ellen Rawlings, Gabrielle Wimberly. THOMASVILLE - South Georgia Ballet company dancers from Thomasville studio, South Georgia Ballet Conservatory, recently attended BalletFest Atlanta, a weekendlong dance festival that gathers dance companies in a non-competitive atmosphere. Performing dancers spent months in additional classes and prepared two original ballets to present at the festival performances. Dancers from SGB/SGBC are Abby Chapman (from left), Tori Cordista, Emily White, Gabrielle Wimberly, Lauren Kelly and Elizabeth Barrow. Not pictured are Riann Duggan, Jewell Grace Gammill and Maria Dunbar. THOMASVILLE - Melissa June, South Georgia Ballet artistic director, trains Step UP! dancers for their role as Bon Bons in the upcoming performance of The Nutcracker scheduled for Nov. 29 and 30 at Thomasville Municipal Auditorium. The students, from the Marguerite Neel Williams Boys and Girls Club and the Thomasville Community Resource Center, will perform in the school matinee show for an audience of their peers on Monday, Dec. 1. 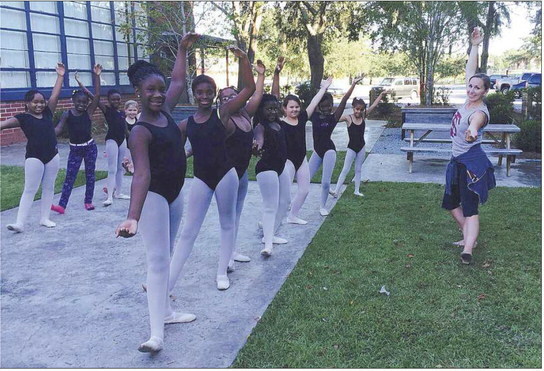 THOMASVILLE — A local student from South Georgia Ballet has received a full scholarship to study yearround with Miami City Ballet. Dylan O’Neal, 15, of Thomasville, auditioned and was accepted to study during his high school years with Miami City Ballet. O’Neal began dancing with South Georgia Ballet three years ago as a seventhgrader under the direction of Alison Bundrick and Melissa June. His training with SGB included five ballet classes a week, in addition to tap, jazz and contemporary classes. His talent and education with SGB paid off, as O’Neal was one of 25 dancers out of 200 who were offered a position in the year-round school at Miami City Ballet. He was one of the few who received a full scholarship and also was accepted to Florida State University’s dance department, as well as the National Ballet Academy of Denver. O’Neal will attend Beach High School in Miami during the day and receive intense ballet training each day after school, as well as on the weekends. Miami City Ballet is heralded as one of the top ballet companies in the world, and O’Neal will train with the best dancers from around the country. June, artistic director of South Georgia Ballet, is proud of O’Neal’s accomplishments and his opportunity to train with a prestigious, professional ballet company. THOMASVILLE — “The Nutcracker,” a beloved family tradition, will kick off South Georgia Ballet 2014-2015 season, SGB’s 17th season, on Thanksgiving weekend, Nov. 29 and Nov. 30, at Thomasville Municipal Auditorium. A special Nutcracker Tea will be held before the Sunday matinee on Nov. 30. An abbreviated group matinee is planned for Monday, Dec. 1, to reach children who might have never attended a ballet. The season continues with a winter production, “Fuse: Boots and Ballet,” set for Friday, Jan. 30, 2015, at Thomasville Center forthe Arts.The collaborative event will feature Southern rock with live music and dance. It promises to be a fun andlively evening.The season will conclude with an original youth ballet, “The Princess and the Frog,” to be held at Cairo High School auditorium in three performances May 29 and 30. “We have so much fun with our original stories, and ‘The Princess and the Frog’ will be just as creative and will showcase students from South Georgia Ballet Conservatory, the official school of SGB, as well as our company dancers,” said Alison Bundrick, founding director. Company training began in July with a twoweek summer intensive dance camp held in cooperation with Thomasville Center for the Arts. The intensive camp concluded with a showcase performance featuring the works styles, as well as variations, partnering, conditioning, nutrition, Zumba and dance history. South Georgia Ballet seeks donations for the season through the tax-deductible Friends of the Ballet membership program and offers corporate sponsorships to area businesses. For information about the company, the season or how to contribute to the season, call 229-228-9420 or visit www.southgeorgiaballet. org. Tickets for The Nutcracker will be on sale to the public through the website, as well as by phone, fax and mail beginning Friday, Oct. 31. THOMASVILLE - Last year, South Georgia Ballet Conservatory formed the American Dance Competition Program headed by SGB Ballet Mistress, Emily Chapo. The ADC program is specifically designed for preparing our upper division company dancers of South Georgia Ballet and South Georgia Ballet Conservatory to compete in the international ballet competition, the American Dance Competition held annually in Orlando and Daytona Beach, Florida. In 2013, six talented soloists competed in both classical and contemporary genres, with high scores and scholarships awarded to SGB dancers. The first year of this program was such an overwhelming success, so SGB has expanded our program in the 2013-2014 season to bring four soloists and an ensemble piece of eight to represent South Georgia Ballet and South Georgia Ballet Conservatory. SGB senior company dancers Alejandra Daniel and Emily White will be competing classical ballet variations, and Maria Dunbar and Rachel Willis will be competing original contemporary choreography. Our ensemble dancers include SGB senior and apprentice level company dancers Dylan O’Neal, Gabrielle Wimberly, Christina Maggitas, Faith Luke, Alejandra Daniel, Maria Dunbar, Emily White and Rachel Willis. Each dancer will also be participating in a scholarship expo, hosted by the American Dance Competition, taking master classes from the best of the ballet world and auditioning for scholarship monies and admission to professional schools and international summer programs. The American Dance Competition will be held from March 19-23, 2014 and can be streamed live from www.adcibc.com. SGB dancers have trained very hard this year and will represent our company and school with poise and technical proficiency. A showcase of their work will be presented on Thursday, March 13 in the Thomasville Center for the Arts Annex building at 6:15 pm.